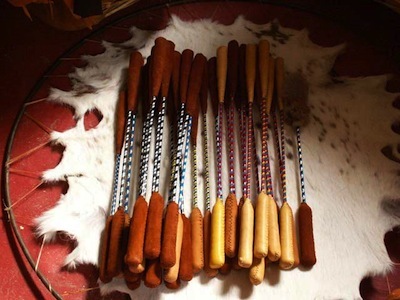 Traditionally, powwow drumsticks were made with wood. In our case, we use ash wood because of its flexibility, as in baseball bats or Canadian maple. Some 'modern' powwow drumsticks are made with a thin fiberglass rod. When playing on the big drum, the fiberglass stick flexes with each beat, allowing the player to drum and sing for hours (no carpal tunnel syndrome here). Making these drum sticks is labour intensive, with double-sided heads of hand-sewn deer leather on a pinstriped stick. For hand drums, our drumsticks are usually made with wood branches (typically maple, which grows up the mountain behind our house) with hand-sewn deerskin heads filled with raw sheep's wool. Each hand drum we sell comes with a stick. We always have extras on hand (and so should you!) for those who participate in hand drum workshops and never got around to finishing their stick.